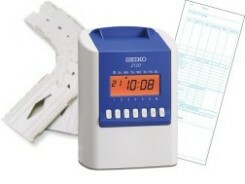 Engineered for value and simplicity, the Seiko Z120 is an electronic time recorder designed specifically for small businesses to easily and accurately log employee activity. The Seiko Z120 features automatic column changes, special mark printing for irregular recognition and time signal capability as standard. The Amano BX-1500 time recorder was built with the aim of providing the most essential functions with the easiest operations.